The Chaouia, in the Aurès Mountains in northwest Algeria, was once considered a sub-variety of the Guelma but is now considered a separate variety of the Brown Atlas, deriving from the Cheurfa. The Chaouia and the Moroccan Brown Atlas were once known as the Mauritanian type — supposedly the largest type in the Atlas Mountains. 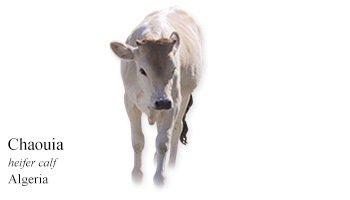 My Daily Cow® Algeria and read about other Algerian cattle breeds.